Waikiki's white-sand beaches are not Oahu's only amazing attractions. No trip is complete without seeing Oahu's iconic mountain peaks. 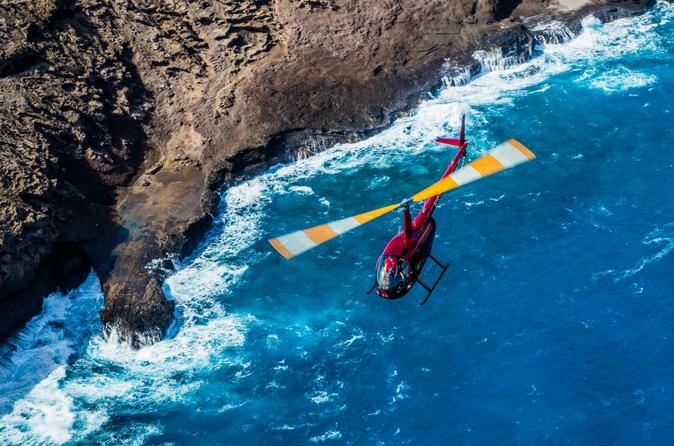 This 30 minute helicopter tour offers views of Diamond Head, the three peaks of Mt. Olomana, and Nu'uanu Pali. Along the way, you will also see the emerald waters of Haunama Bay, the lighthouse at Makapu'u Point and Pearl Harbor. The lush tropical vegetation of the Nu’uanu Valley masks a secret: Oahu was born from fire. The best way to appreciate the incredible beauty the immense flows of lava produced is through the air. Your helicopter sightseeing experience begins over the island’s South Shore so you can see the Honolulu skyline and Diamond Head crater in a way not possible from the beach. Hanauma Bay’s sheltered waters and incredible coral reefs pass below you as you soar among the nearby cliffs and volcanic outcroppings – the remnants of the island’s volcanic birth. Rounding Makapu’u Point, you follow the Windward Coast and its long stretches of white sand beaches and turquoise waters as they lead you towards the gorgeous mountains beyond. Turning inward you pass the three sharp peaks of famous Mt. Olomana, characteristic of its English translation, “divided hill.” A breathtaking passage through the Nu’uanu Pali cliffs and the lush rainforests that lie within leads you back to the Leeward side of the island and Pearl Harbor. The flight ends with a pass over the USS Arizona Memorial and a new appreciation of Oahu's volcanic origins and its spectacular terrain.